Learn how to make the switch from PC to Mac a completely smooth transition The number of Mac users continues to increase significantly each year. Learn how to make the switch from PC to Mac a completely smooth transition The number of Mac users continues to increase significantly each year. If you are one of those people and are eager but also anxious about making the switch, then fear not! This friendly guide skips the jargon to deliver you an easy-to-read, understandable introduction to the Macintosh computer. Computer guru Arnold Reinhold walks you through the Mac OS, user interface, and icons. You'll learn how to set up your Mac, move your files from your PC to your Mac, switch applications, get your Mac online, network your Mac, secure your Mac, work with the iLife suite, troubleshoot common problems, and more. 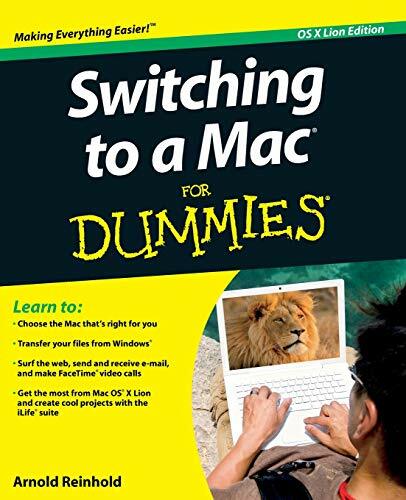 Dives in to helping you make the switch from PC to Mac as smooth and effortless as possible Walks you through the latest features of Mac OS X Lion to help you take advantage of all the cool things your Mac can do that you might not know about Offers clear instructions for working with the iLife applications, running Windows on your Mac via Boot Camp, networking your Mac, and switching your family or your business to a Mac Shares essential advice for troubleshooting common problems and provides easy tips for keeping your Mac happy Switching to Mac For Dummies, Mac OS X Lion Edition is all you need to switch to a Mac and never look back!